You’re starting to think this could be a record-breaking season. The legs have never felt better. You’ve got new gear. And you spent your off-season in a very rigorous après-ski training program. Yet, unless they invent baseball cards for skiers, or Warren Miller comes out of retirement, your accomplishments would go unrecorded. 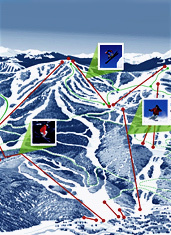 Introducing EpicMix, a new stat-tracking system that stores your greatest skiing achievements, available online now. Because you don’t just ski for the stats, but also for virtual glory (and the occasional Olympic medal), you can post your stats to Facebook and Twitter. As you progress, you’ll also unlock various “achievements,” like the Monogamist (riding the same lift 10 times in one day), the Snow Turkey (skiing on Thanksgiving) and the Steve Austin (for covering 6,000,000 vertical feet of snow). No word yet on an award for most hot tubs sampled.